Flock and Fiber? Yes Please! 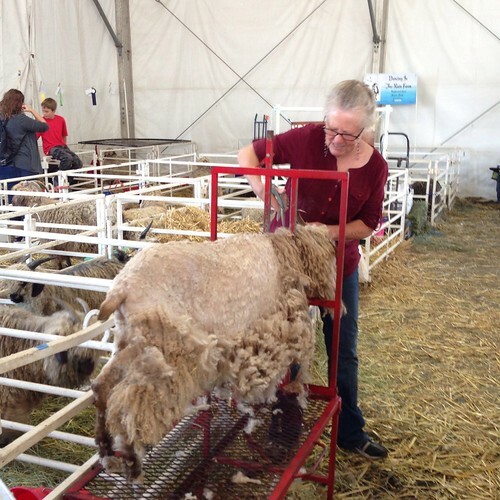 Oregon Flock and Fiber Festival is just around the corner! 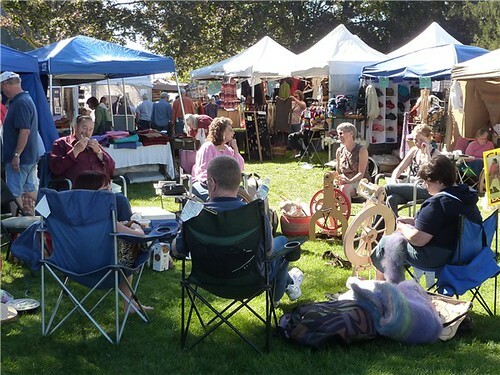 This local fiber festival has something for everybody: yarn, fiber, classes, animals, cooking, shopping, and more. I’m teaching two classes this year. 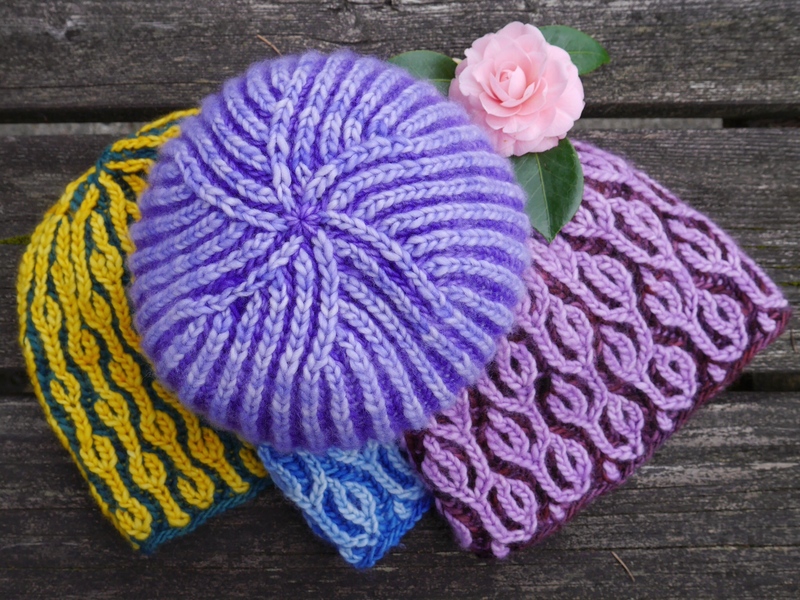 Brioche Pastiche is sold out; I’m really looking forward to introducing more knitters to two color brioche in the round! 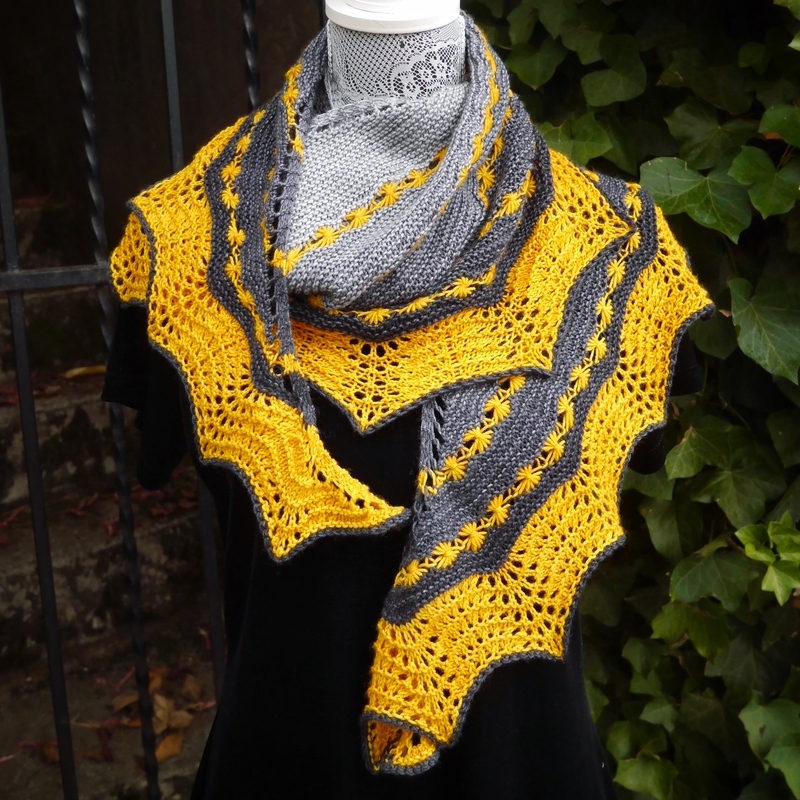 There’s still room in my Favorite Shawl Shapes class. 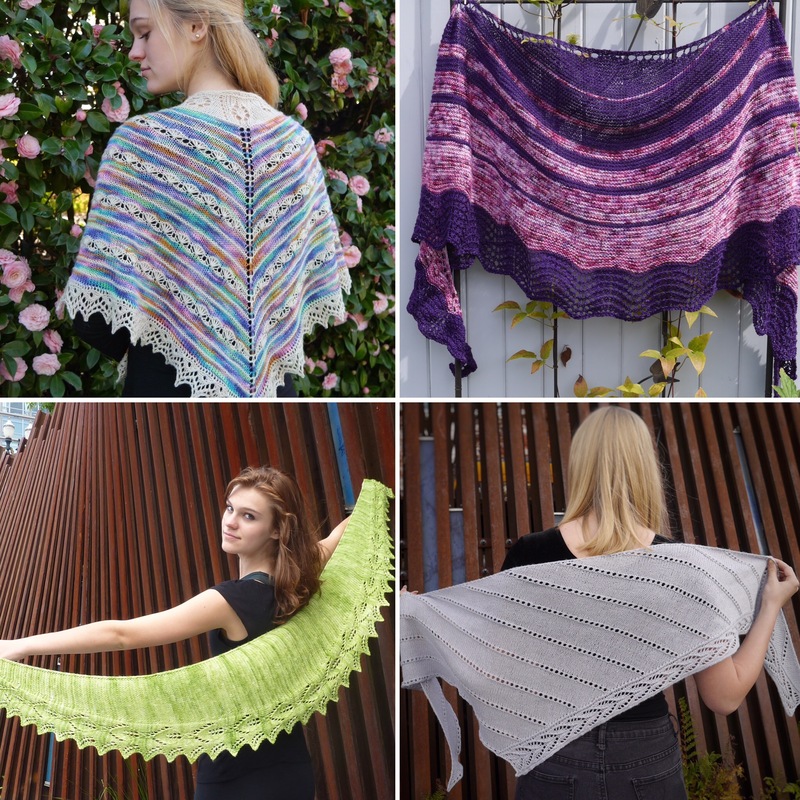 We’ll make mini samples of four of my favorite shawl shapes, and talk about how to incorporate your design ideas into them. 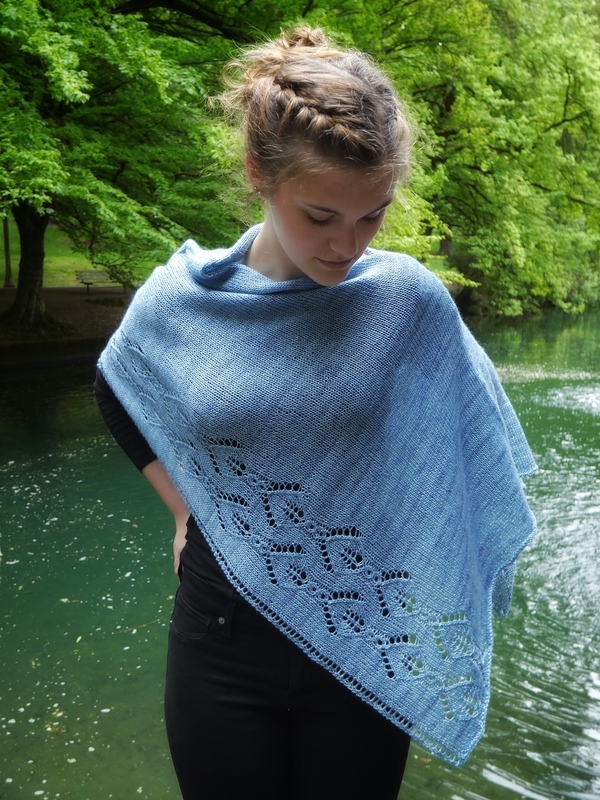 You’ll have a better understanding of how shawls are made, and a good basis for designing your own. Come join me on Saturday morning, September 22. Registration link is here; pre-register by September 8 to make sure you get the class info you need. I’m judging the knitting entries at OFFF again this year. 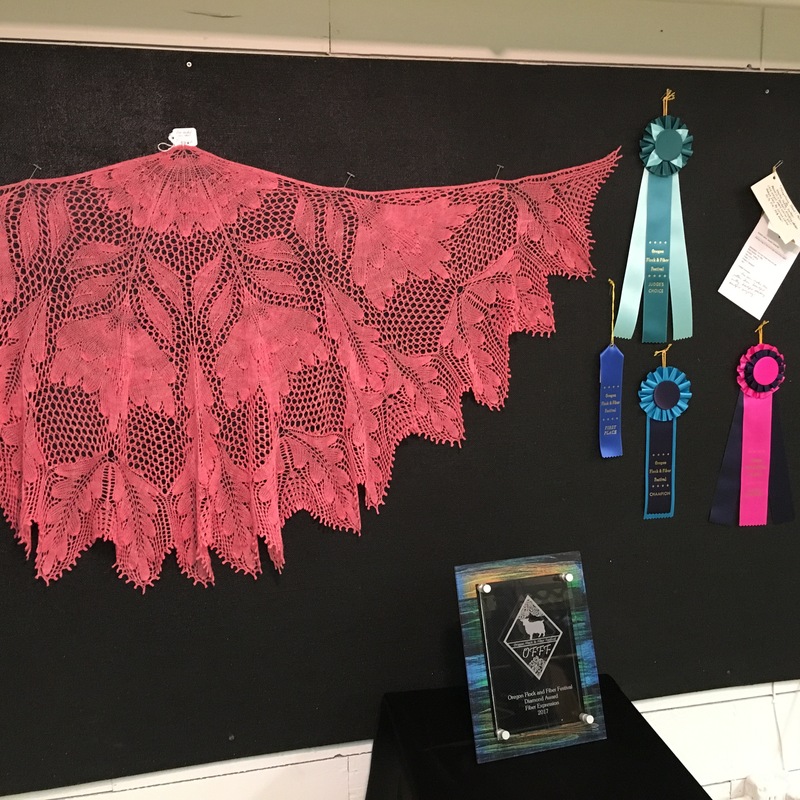 It was educational for me last year, and I hope my comments on lasts year’s entries were educational for the knitters! You can enter your knit, crochet, felted, woven, and other fiber projects at OFFF, as well as spinning. 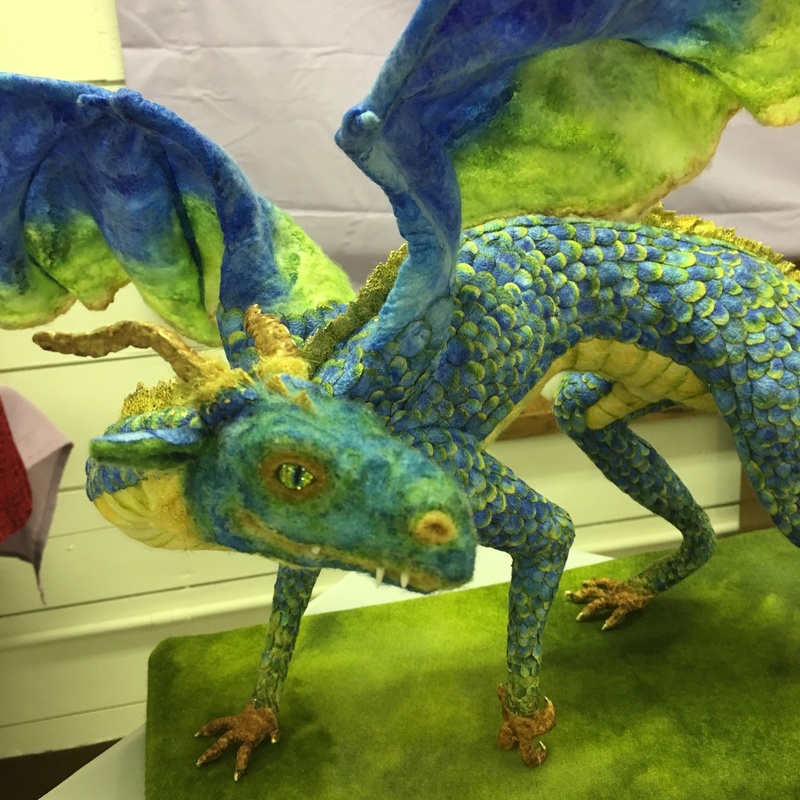 Last year’s winners were stunning, and all of the entries were worthy of praise. One more class! 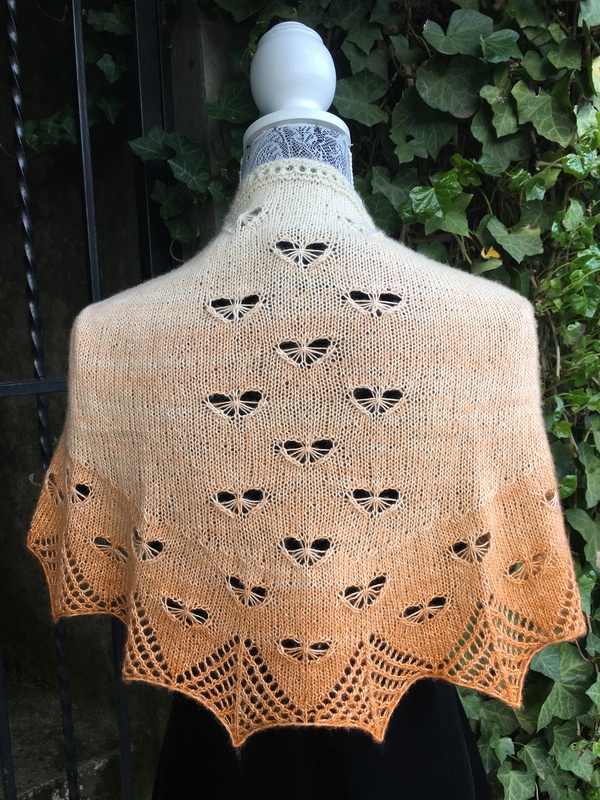 A reminder that registration is happening now for the Nymphaea Shawl Retreat that I’m doing with Laurinda Reddig at Quinn Mountain Retreat in the Columbia River Gorge (near Camas), Nov. 9 – 11. There are only 4 knitter’s spots left. 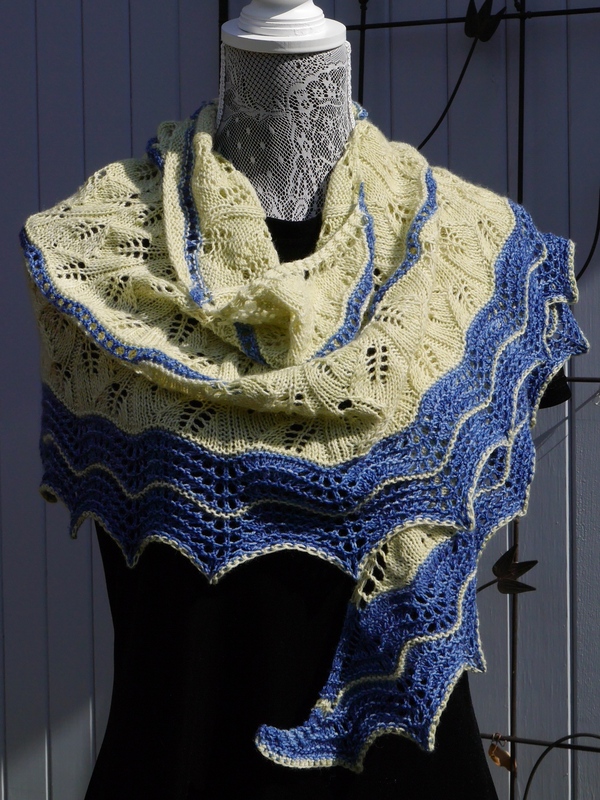 Come get a jump start on knitting or crocheting this beaded shawl with us! 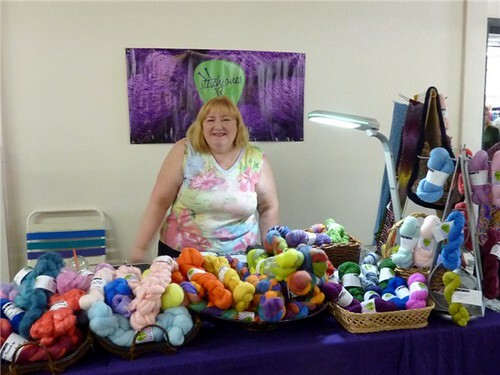 Gradient yarn by Fierce Fibers and beads are included in the registration price. Registration link here. 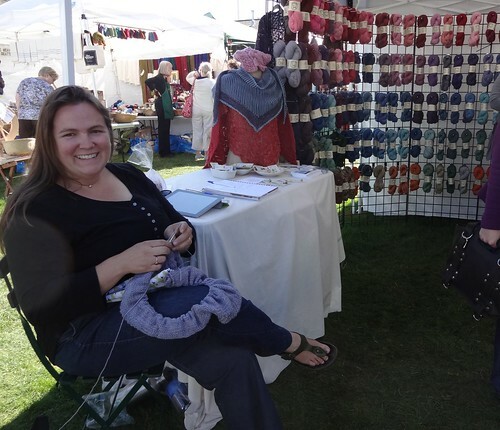 Fall is coming; make plans to get your knit on! September flew right on by! A birthday, an anniversary (35 years! 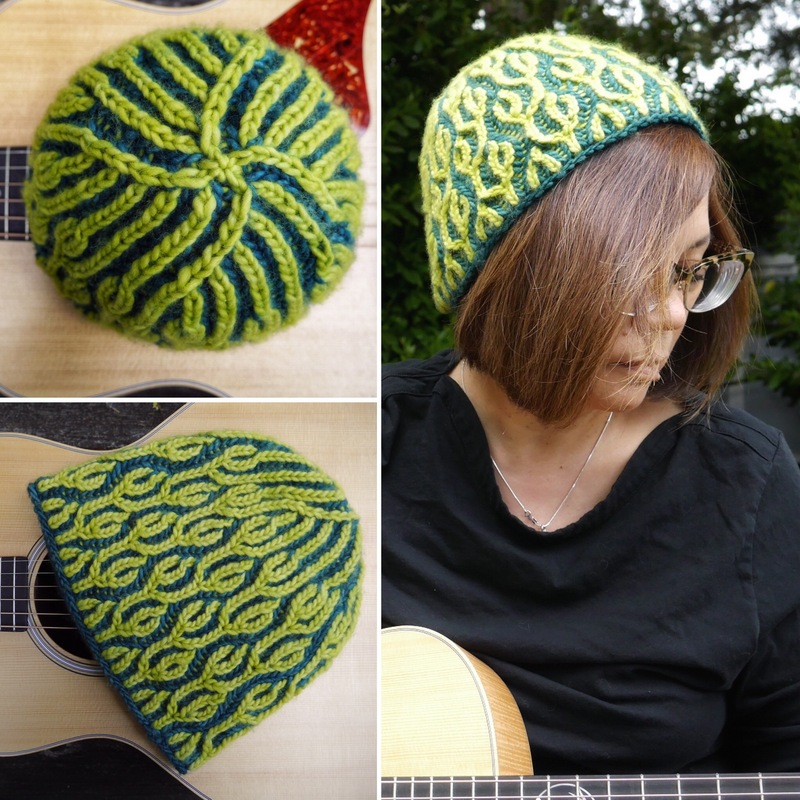 ), a pattern in By Hand Serial #4, and Oregon Flock and Fiber Festival. I had the great good fortune to be the knitting judge at OFFF, and it was challenging and fun. 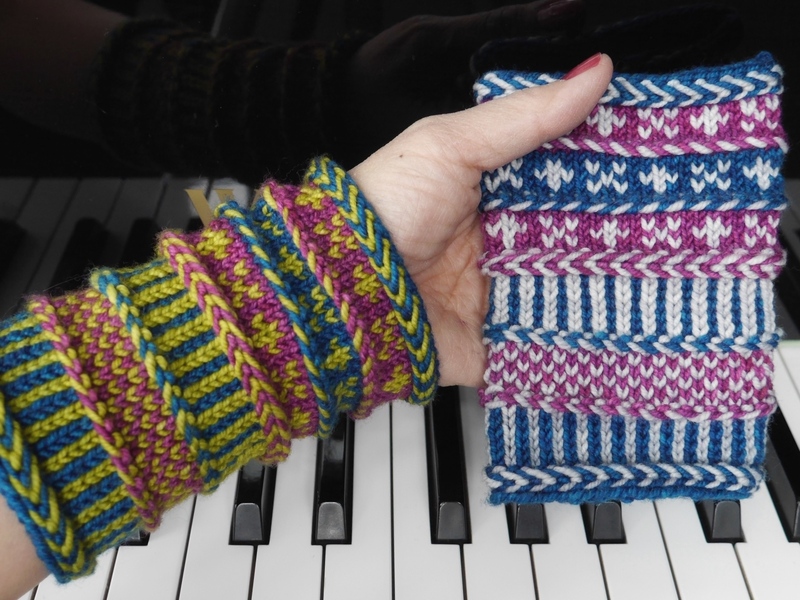 I worked with two scribes, and made my way through a vast number of knitted goods. 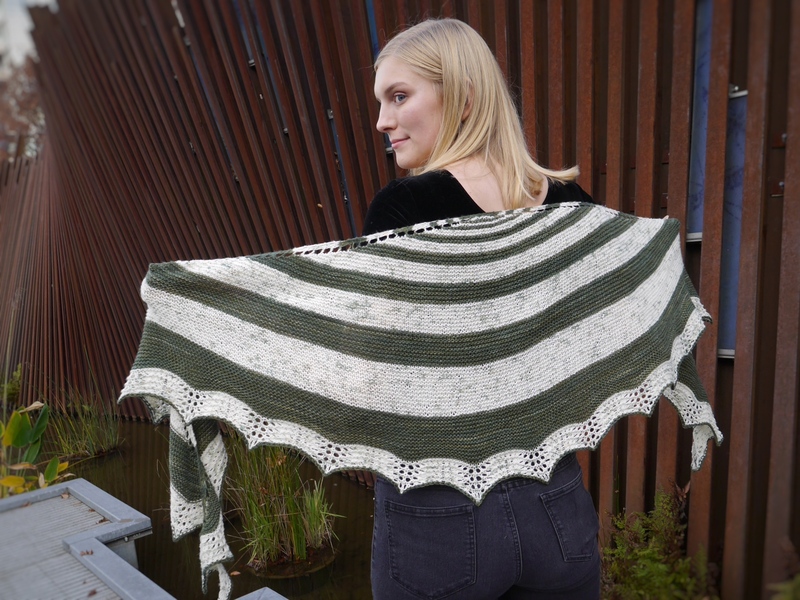 You may wonder what gets submitted most, and the answer is “shawls!” Which is right in my wheelhouse. 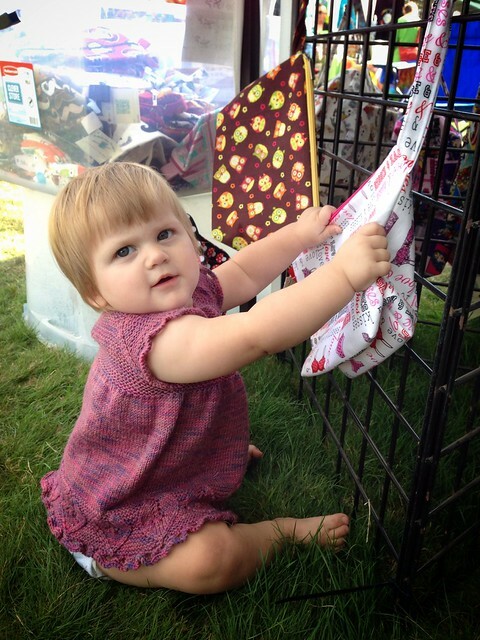 There were also sweaters, scarves, cowls, and some doll clothes. One small blanket and a couple toys. My job was to make categories, comment on all submissions (thank you, scribes! ), and then choose the best in each category. 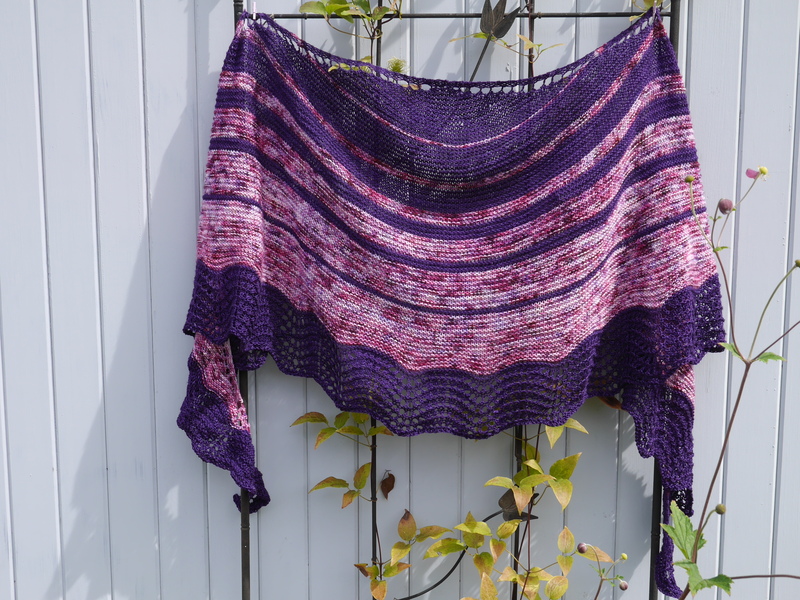 The laceweight shawl above was the best (in my opinion) knitted item. 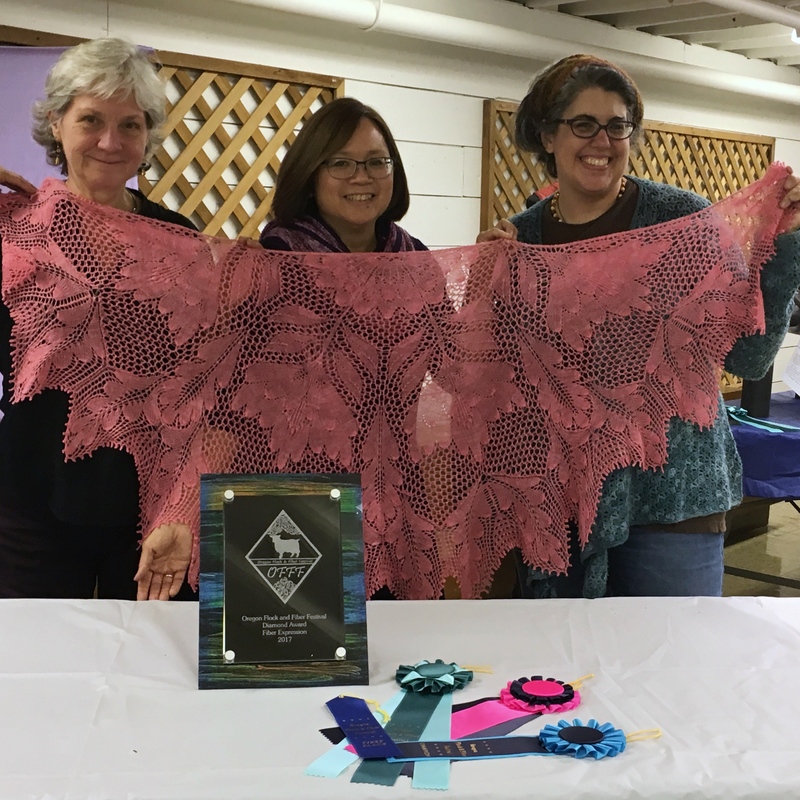 The crochet judge chose this filet crochet dragon shawl as the best crochet piece. And the felting judge chose this piece as the best felted piece. 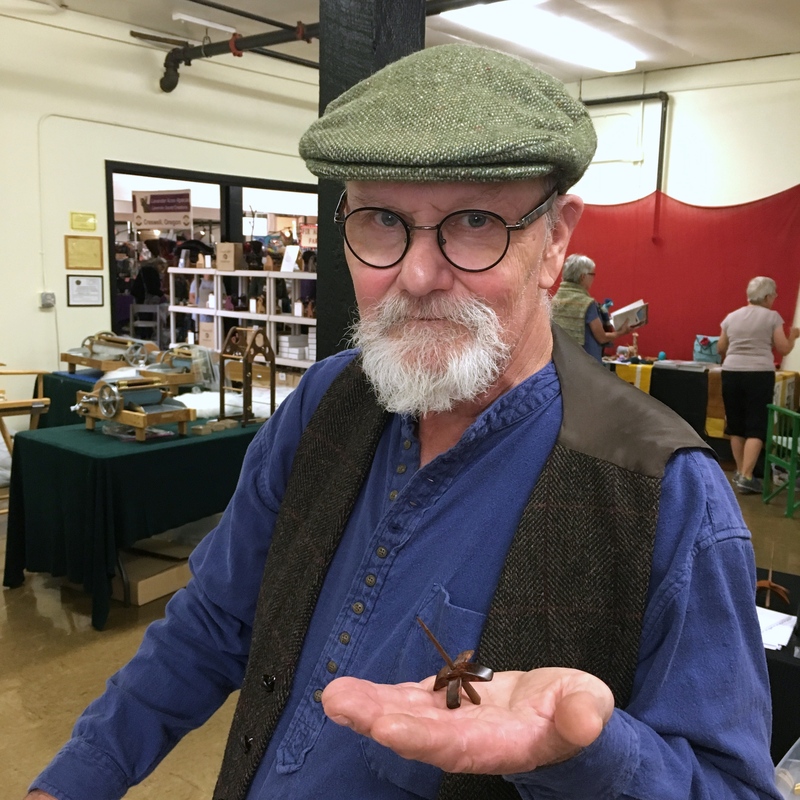 I did a little shopping, and was astounded by the tiny Bee Hummingbird spindles Ed Jenkins is making, even smaller than his Kuchulus. 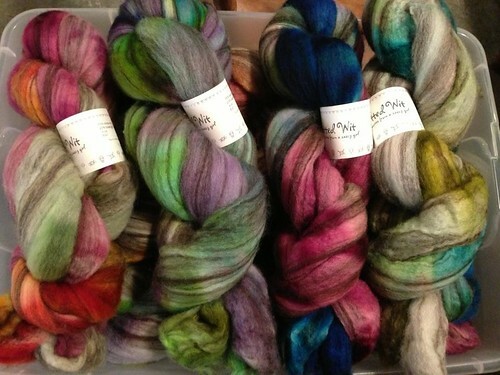 I haven’t spun with the Kuchulu I picked up at Sock Summit 2011, so no new spindle for me! Good thing, because you had to enter a drawing to win the chance to puchase one. My friend Leigh got one, and she’s very pleased. Chatted with Stacey at Fierce Fibers about an idea for another gradient shawl, inspired by some things I saw at OFFF that were NOT knitted. Cross-pollination of ideas, right? 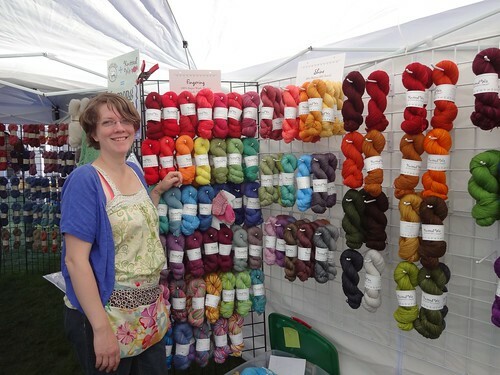 And bought some notions from Maria from A Needle Runs Through It in the Knitted Wit booth. 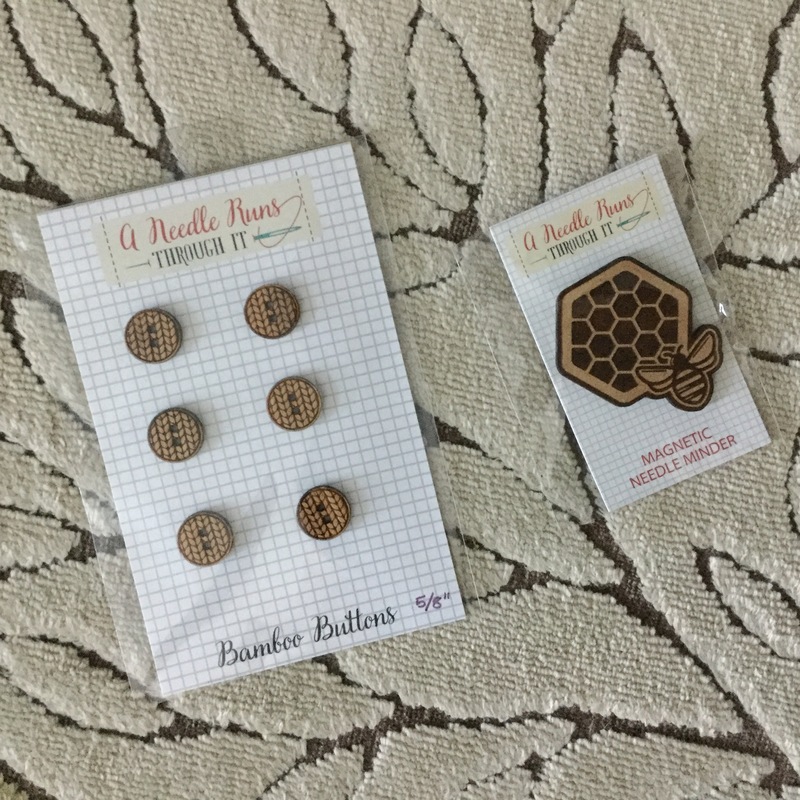 I love useful little things! Don’t forget the animal barns! I never made it to the bunny barn, but my goddaughter E joined me in the main barn. And I taught two classes, Fixing Lace Mistakes and Elongated Novelty Stitches. It was a very full weekend! Still trying to catch up. 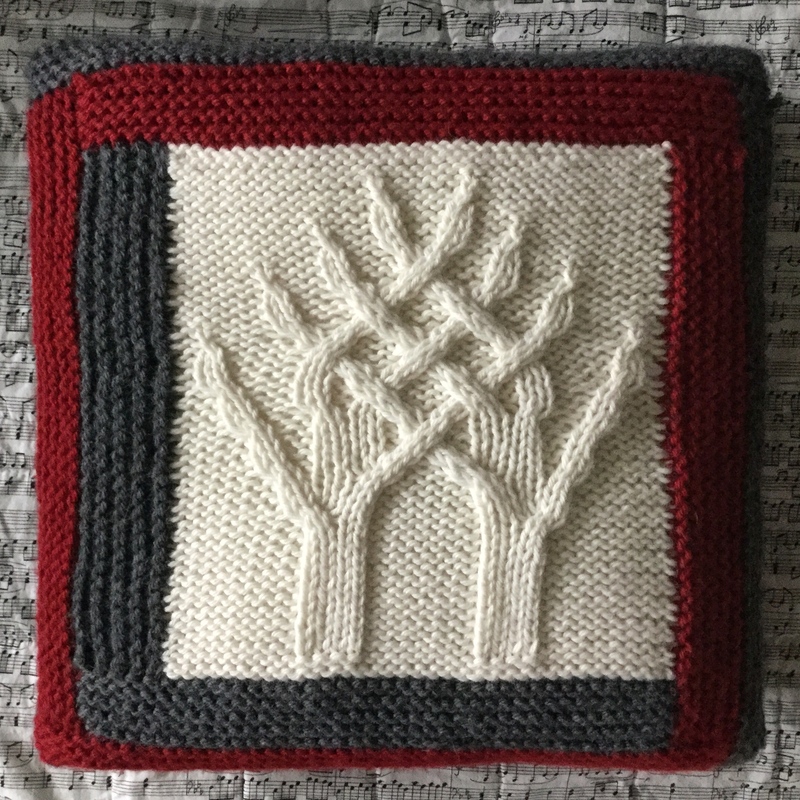 Looking around the blog universe, Facebook, and Instagram, it’s clear that I’m not the only one who feels euphoric about September knitting. Social media is full of posts about new cast ons. I’m here to enable you! I love teaching people to be the boss of their knitting. 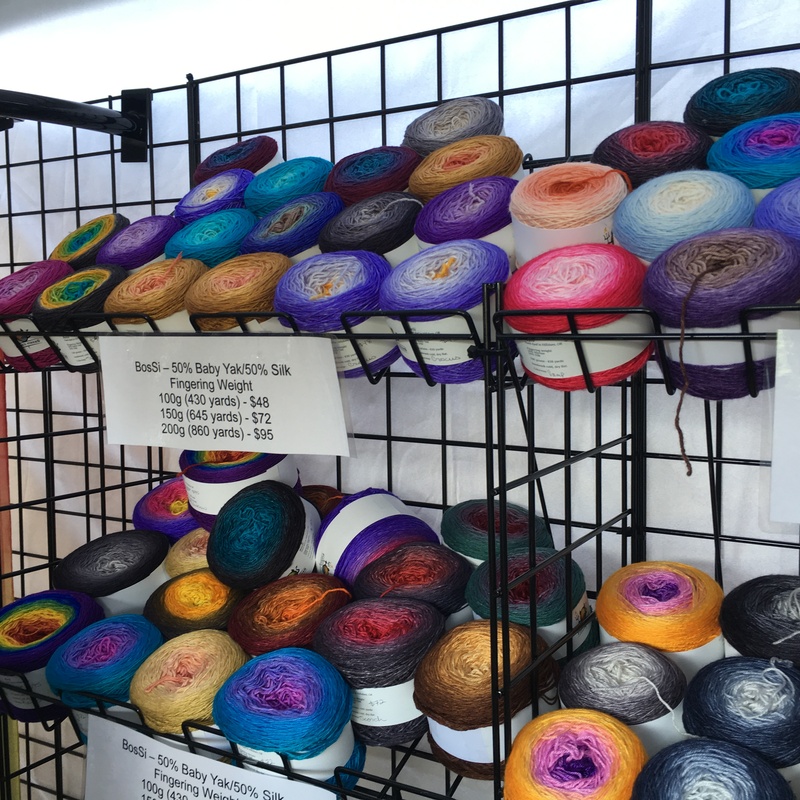 I’ve filled out my teaching schedule at Twisted and For Yarn’s Sake here locally; you can see my classes on my teaching page here. 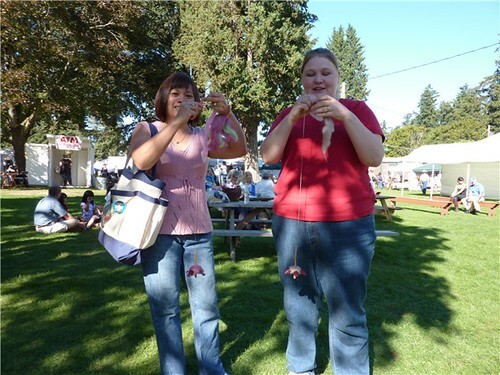 I’m also looking forward to teaching at Oregon Flock and Fiber Festival on Saturday, September 24. 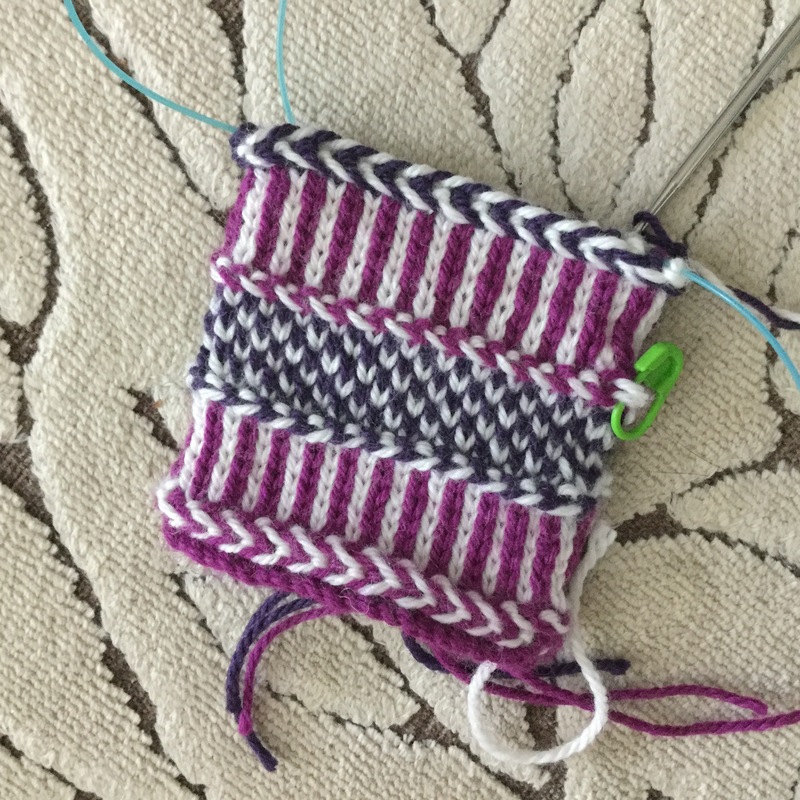 We’re making braided wristlets, with several kinds of braids worked in, as well as lessons on color and yarn dominance, and managing your yarn for stranded knitting. Class description is here; “out of stock” just means that pre-registration is over. 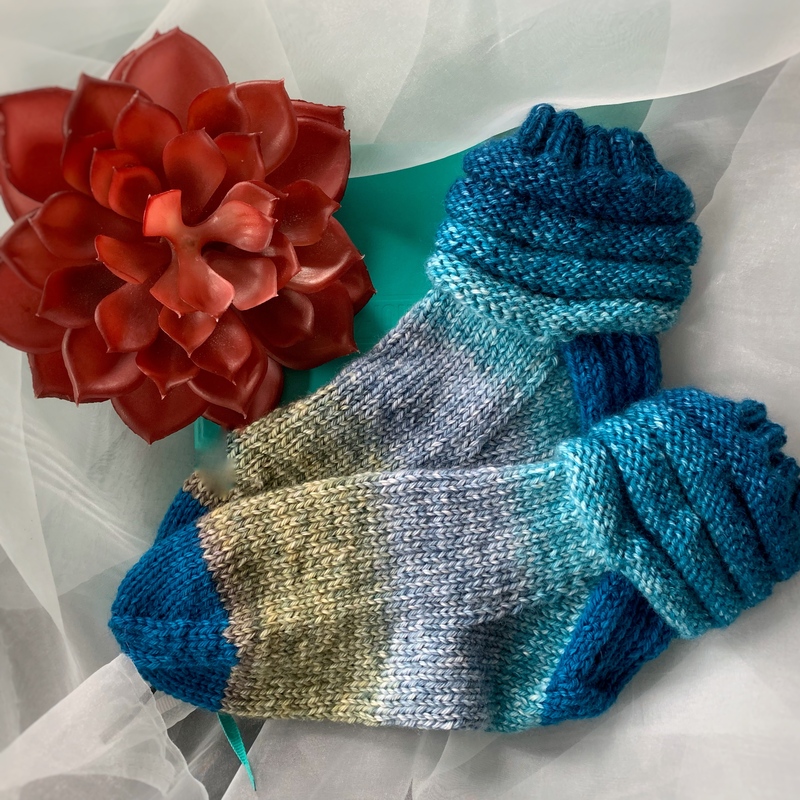 You can sign up on-site at OFFF; class starts at 9:30 a.m. Come a little early if you want to pick up yarn from Knitted Wit for this project; she’ll have these colors kitted up for you. And I’m really excited to be teaching at the Sheeper than Therapy retreat in Fresno, CA, at the end of the month. We have a full slate of fun classes for the weekend: Log Cabin Squares, Braided Wristlets, the Tilt Shift Wrap, and Photography with iPphone/iPad. Looking forward to it! 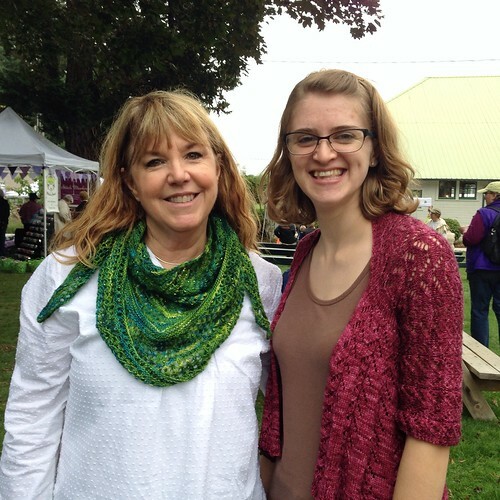 All in all, September is a knitting whirlwind. I love it! What’s on your needles? Are you going to OFFF? What a glorious weekend: Slightly chilly mornings (sweater weather!) giving way to sunny afternoons and smiling crowds. Perfect. 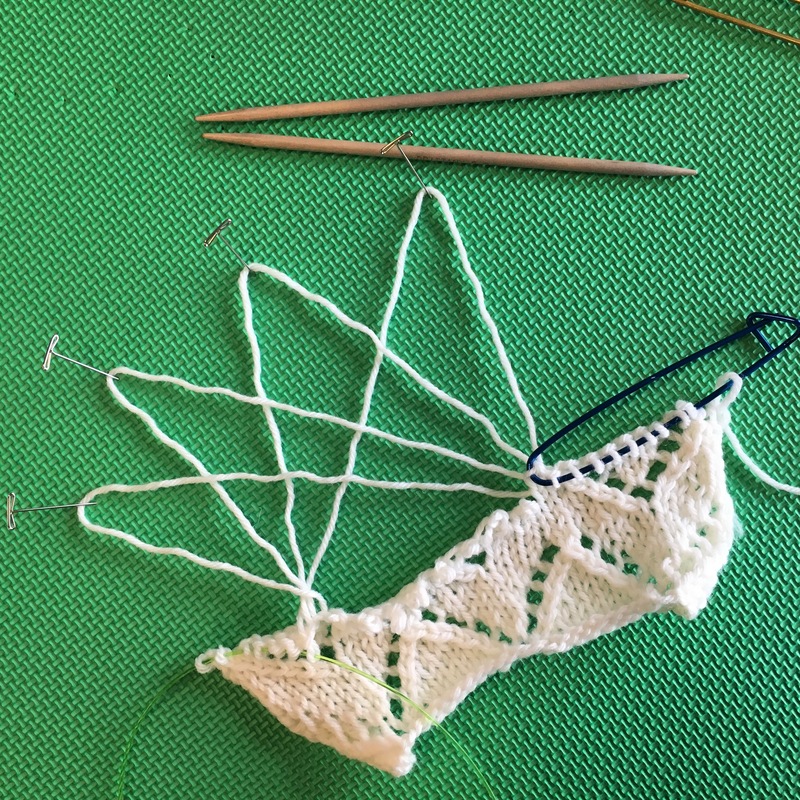 I taught Blocking on Friday, and Tink Drop Frog (how to fix mistakes) on Saturday. 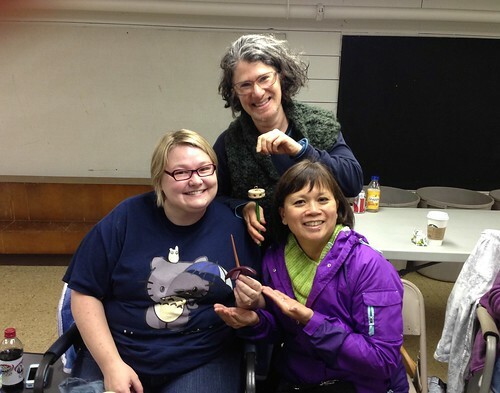 My students were charming and eager to become the bosses of their knitting! 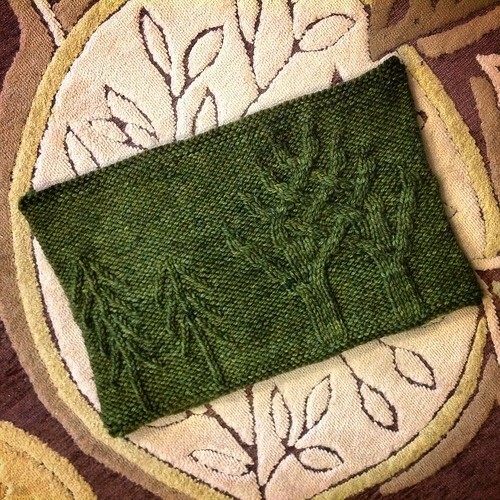 We blocked my Snowy Woods KAL cowl, among other things. Sunday was my play day. I headed for the barns first, and I was not disappointed. 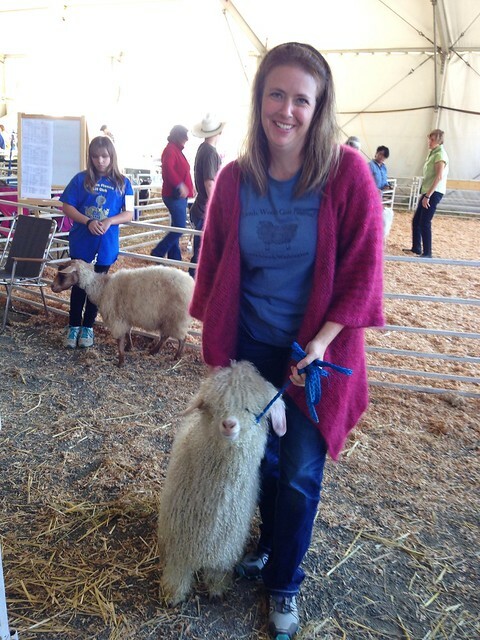 This is Amy with one of the angora goats from The Pines Farm. 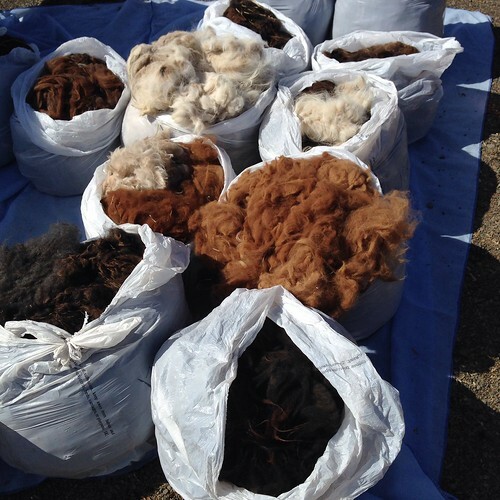 Mohair on the hoof! Amy is wearing a sweater knit with mohair, and it is the most decadently soft fabric, with a luminous halo. Can you even see where you’re going? 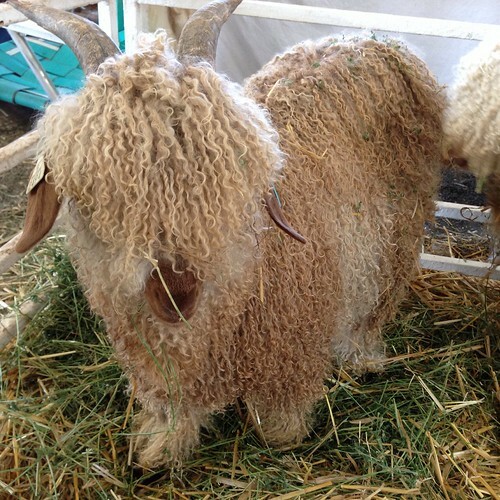 The coat of an angora goat grows an inch per month. These goats are shorn every six months, now and in March, but they still won’t be cold this winter! 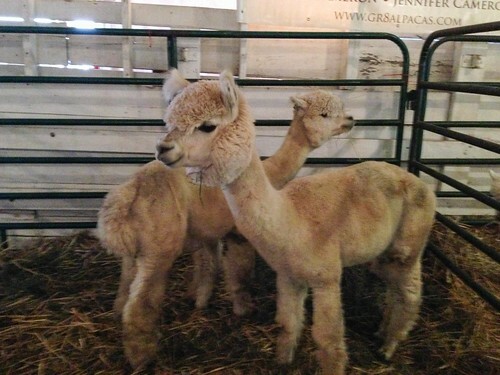 I was captivated by this display at Upstream Alpacas. or colors? I liked them both. Natural colors are not boring. 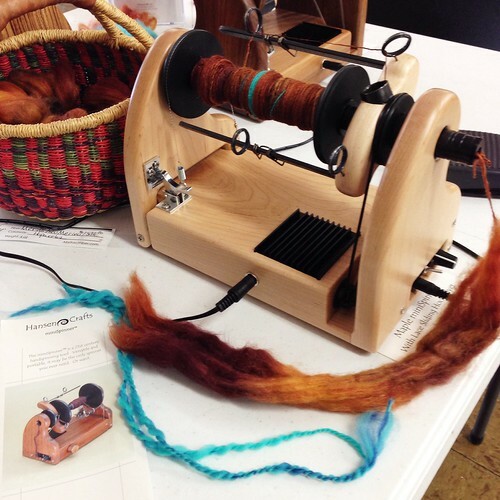 For me this year, the fiber and spinning supplies were most enticing. Maybe because I already have more yarn than I can knit. No matter. Look at these spindles. The gateway drug to spinning. I have several drop spindles, but haven’t yet heard the siren song of the wheel. Then I saw people trying the HansenCrafts miniSpinner. Look how portable this is. I had to try it, too. See my blue yarn? There’s always a fleece sale on Sunday. The woman who lured us in here said that the first time she went, she bought two fleeces. 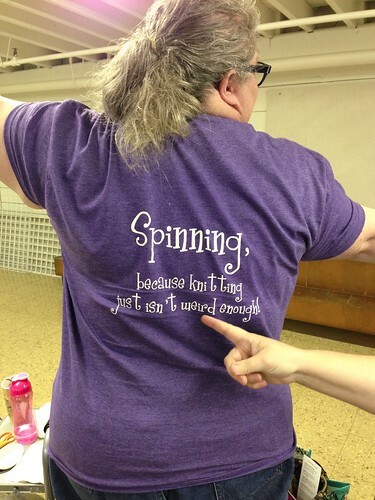 And she didn’t have a spinning wheel, just a drop spindle. Uh-oh. Kromski niddy-noddy, not a wheel! I wanted an upgrade from my one yard niddy-noddy; this one is a two yard model. 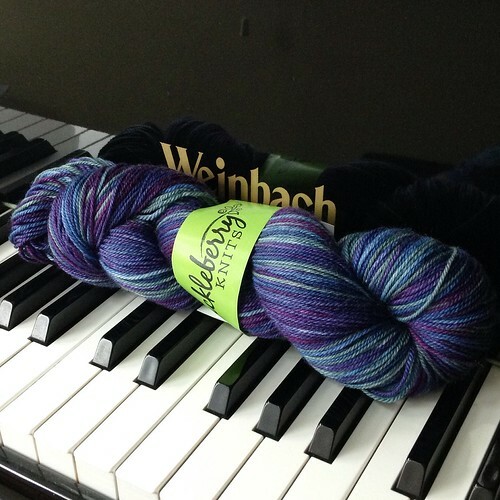 I did buy one skein of yarn, from Huckleberry Knits. It’s Teri’s fault. 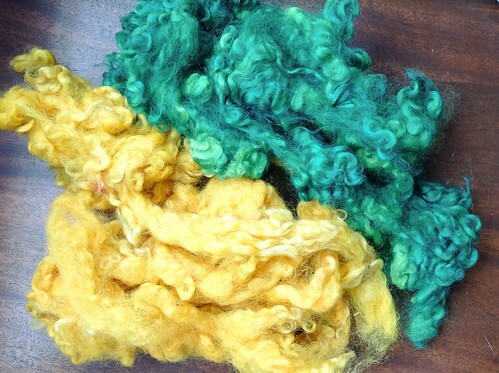 I loved the glowing colors in her Glitz on the Ritz shawlette, so I had to check out this dyer, too. Oh, and see Sherece’s Hitofude? Teri knit that for her. What a great friend! 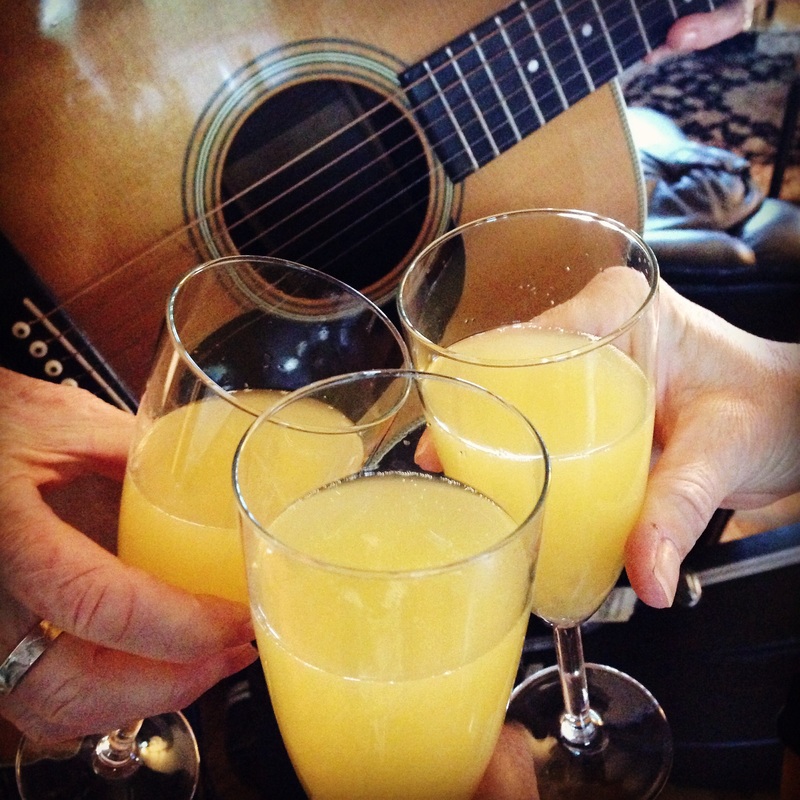 All in all, a perfect weekend. I spent some time with Lorajean and the divine Miss F in the Knitted Wit booth. You have to start them young! Did you go to OFFF? What tickled your fancy? 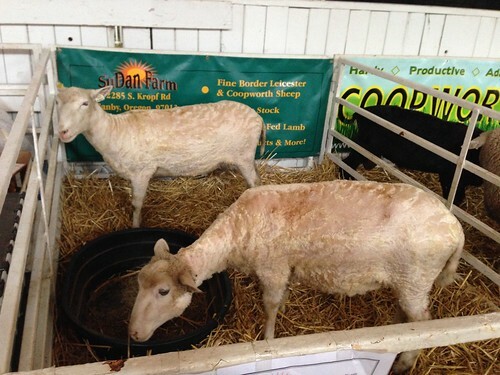 Oregon Flock and Fiber Festival is this weekend. I’m really looking forward to it! I’m teaching on Friday and Saturday afternoons, and playing the rest of the time. The weather report is looking decent as of this moment, which would be great after last year’s monsoons. 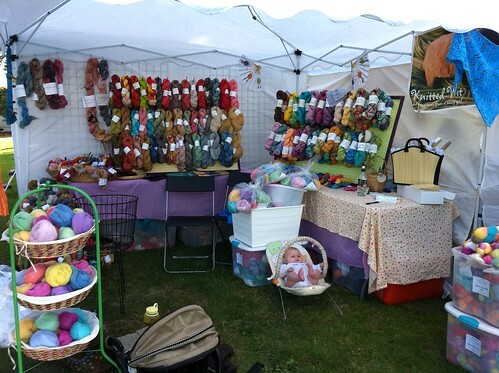 Knitted Wit’s booth. Always lovely things there, and this year she’s debuting her Cotton Candy yarn, 100% merino super bulky. 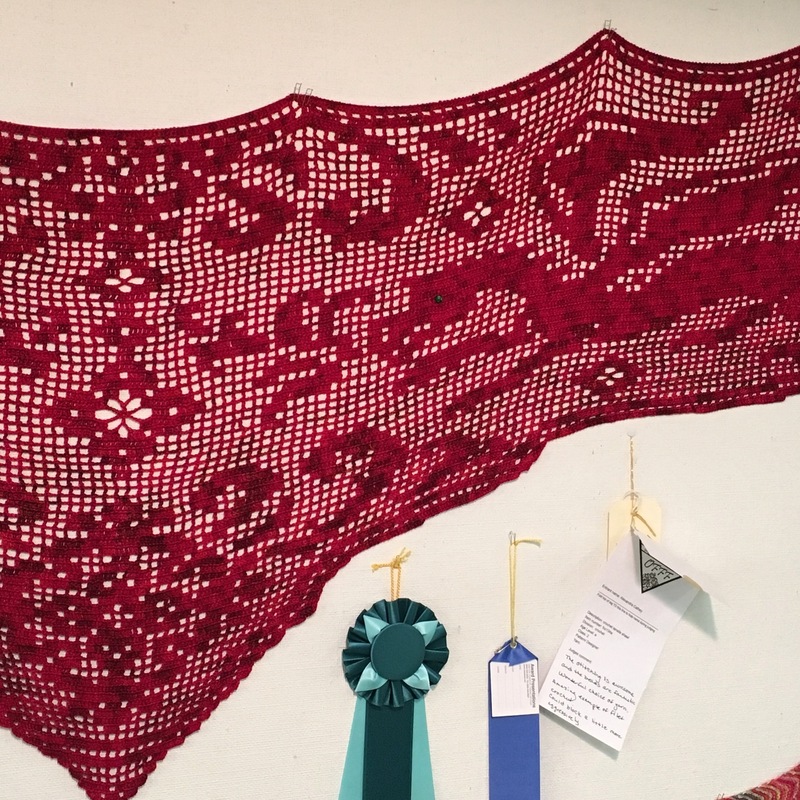 You can see my Big Leaf Scarf and pattern in her booth this weekend. Hanging out with the Portland Spinnerati group. Always entertaining, and always inspiring! I went to the group’s meet-up at the Oregon Historical Society for Worldwide Spin In Public Day last Saturday. I was the only drop spindler in a group of wheels, but it was all fun. I’m also looking forward to shopping, and visiting the animals. 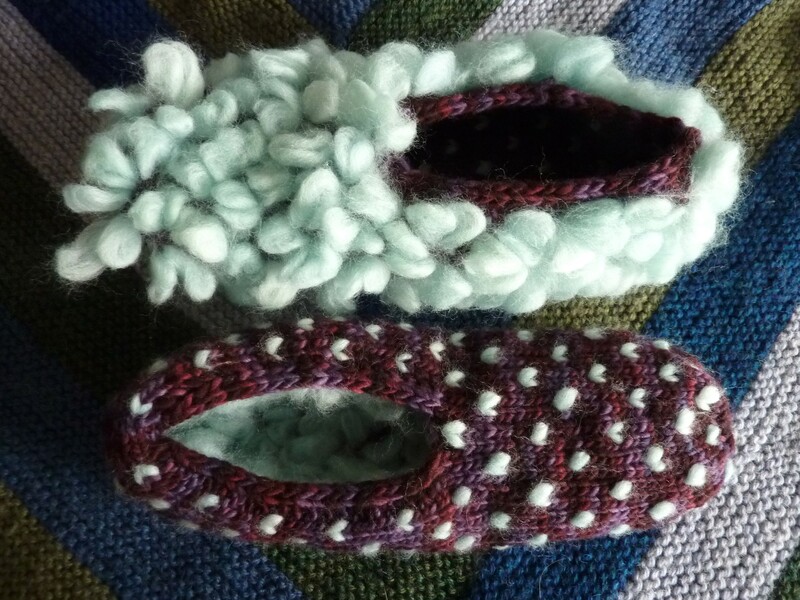 For a much more comprehensive list of things to do at OFFF, see Mary Mooney’s post on the OregonLive Knitting blog. If you see me, say hello! 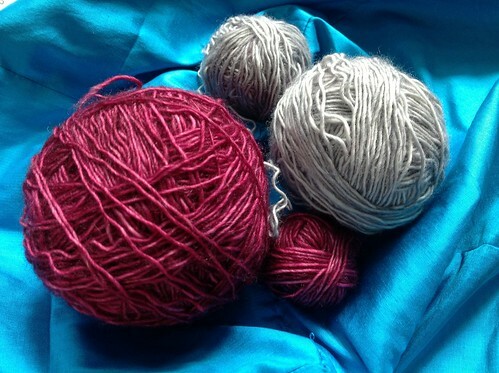 What’s on my needles? I’m almost done with my Snowy Woods Cowl that I’m doing for the knitalong. 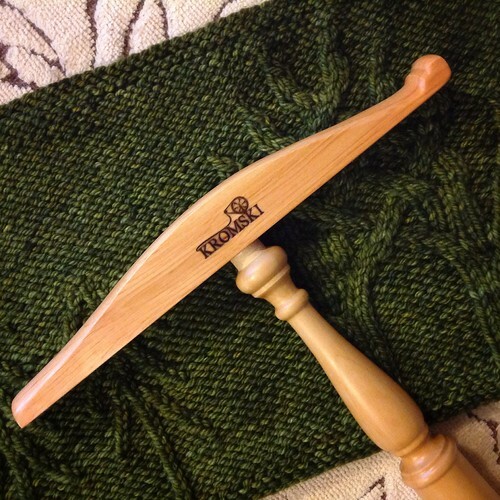 This is the last official week of the KAL, so there’s one more prize to be drawn next week. This week’s prize? 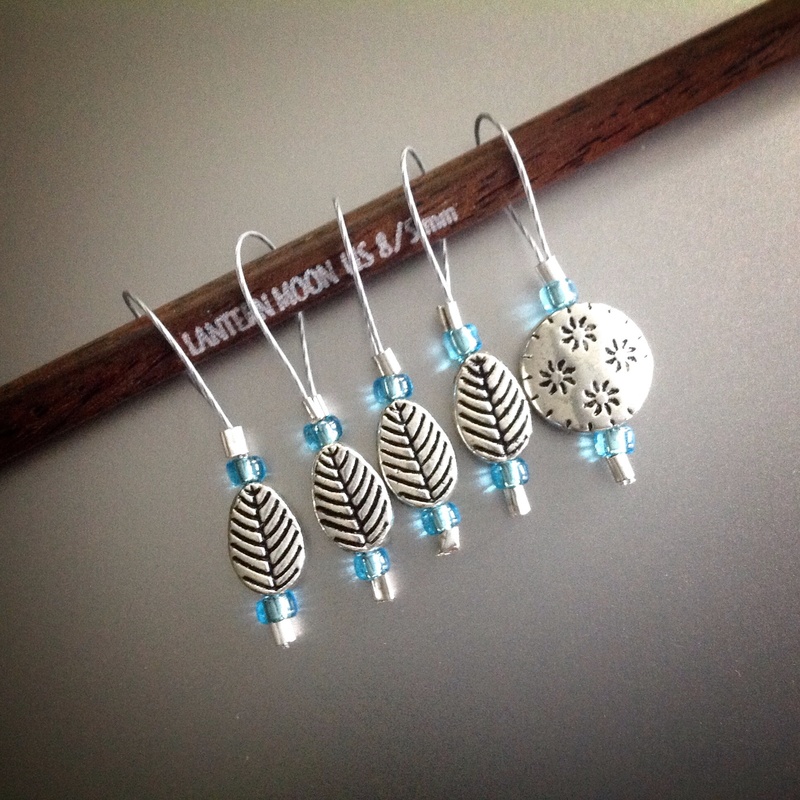 Stitch markers, made by me. 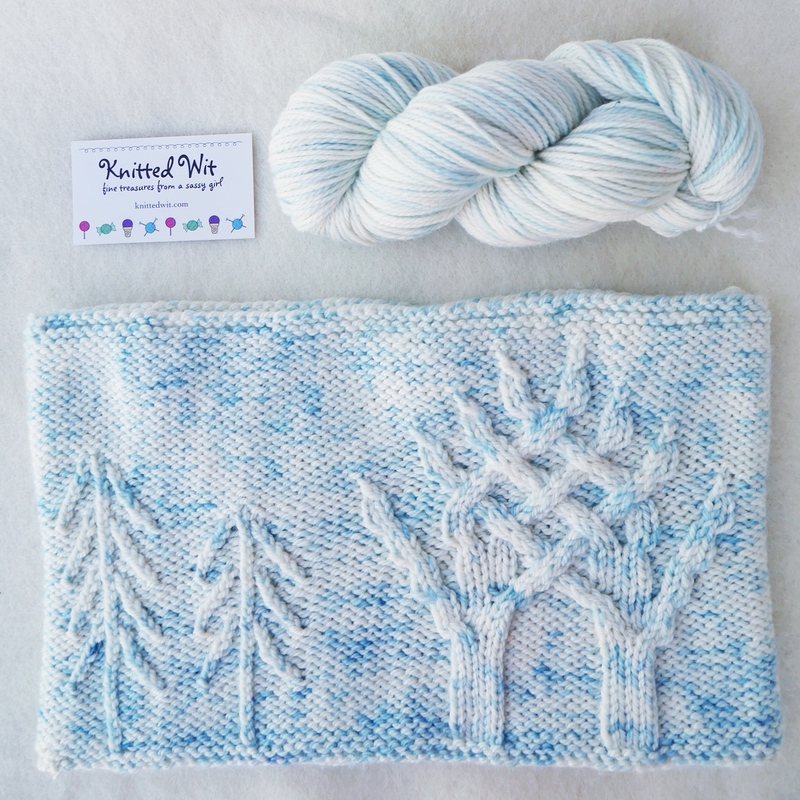 These feature leaves, snowflakes, and the blue of the custom dyed Snowy Woods colorway from Knitted Wit. 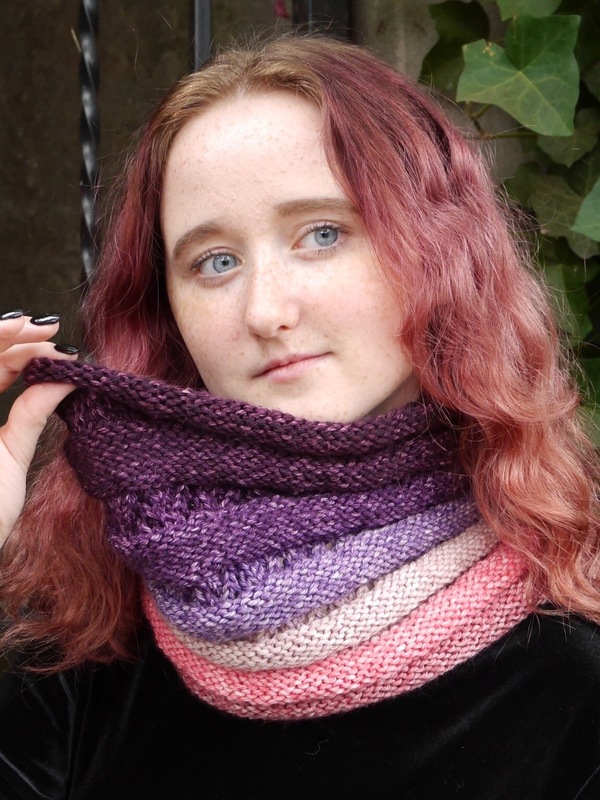 This cowl is coming with me to OFFF, where it will be part of my blocking class on Friday, 1 to 4 p.m. There’s still a little room in the class, and there’s no homework! Registration is onsite only at this point. 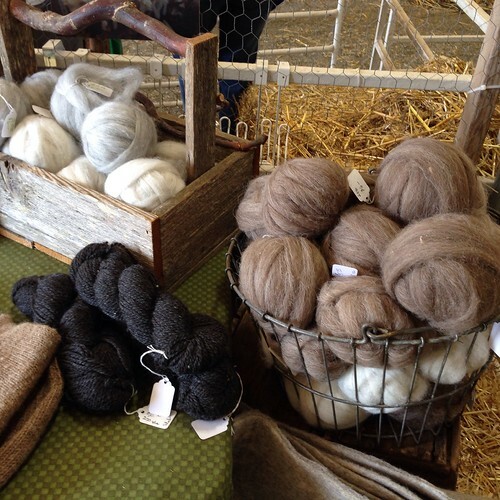 Oregon Flock and Fiber Festival is coming right up! 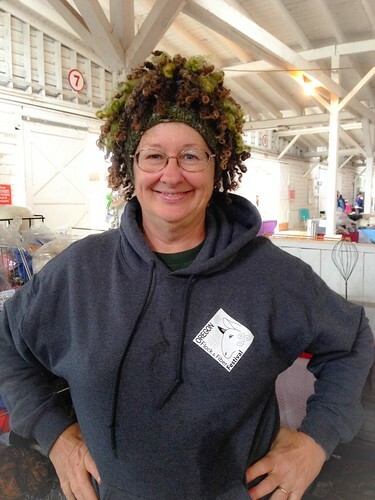 September 27-28, and there are workshops on Friday, September 26, too. 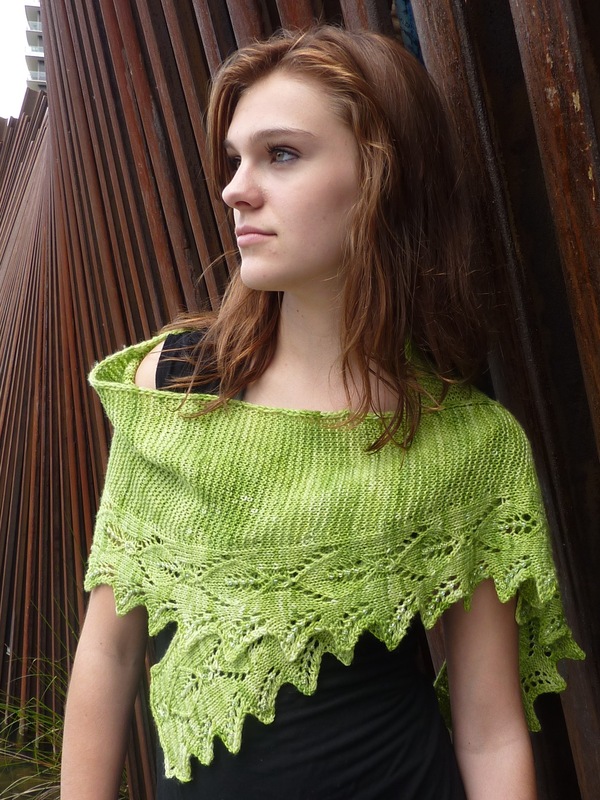 I’m teaching two classes, Blocking on Friday afternoon and Tink Drop Frog: Fixing Mistakes on Saturday afternoon. 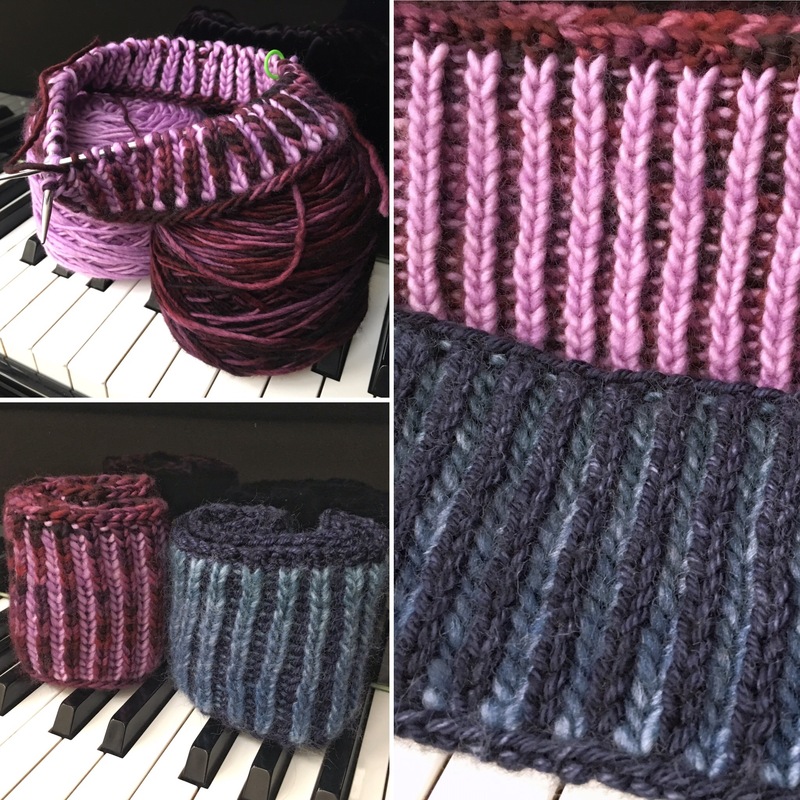 These are expanded versions of classes I teach in yarn shops, and we’ll have three hours to go through even more fun and demonstration on both of these topics. I hope you’ll join me. 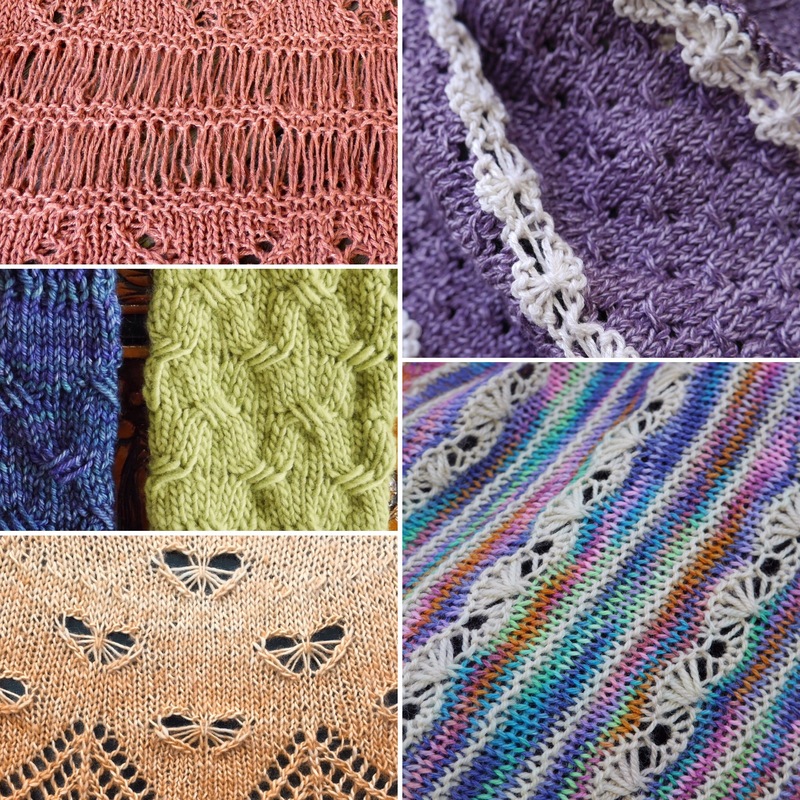 If you’ve already mastered these knitterly topics, there are a lot more fiber-related classes available; you can see the full list here. Taking classes at OFFF is fun, and encourages the organizers to keep offering them from year to year. If you want more knitting classes, sign up for knitting classes! 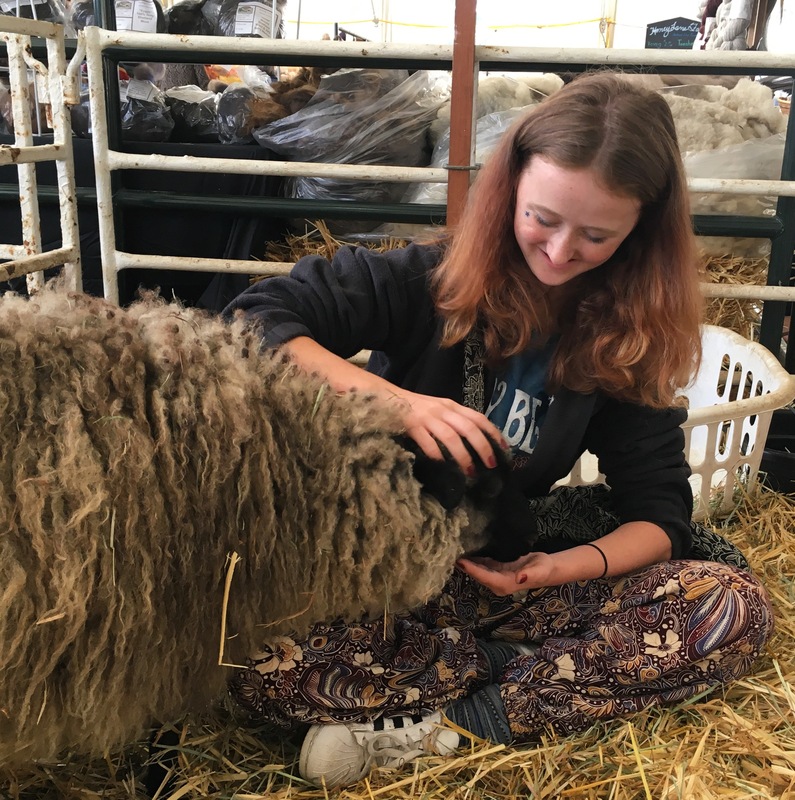 The same goes for spinning, weaving, felting, livestock management…The early registration deadline requires a postmark by September 5. This is the make or break day; if a class doesn’t have the minimum number of students by the registration deadline, the class won’t be offered. You can sign up for classes at OFFF, but only if they make the minimum by the early deadline, so why wait? What else is fun at OFFF? Well, there are the adorable animals. 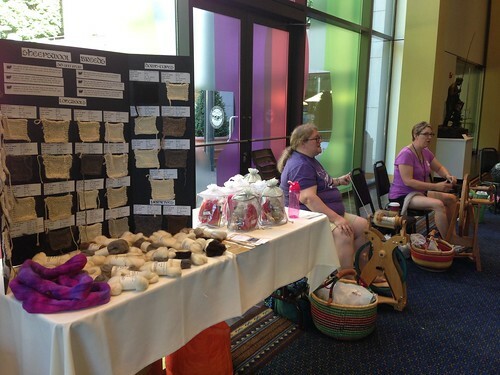 And you can always find people to knit and spin with. So mark your calendar, and I’ll see you there, either in class, or shopping, or on the lawn spinning or knitting, or? 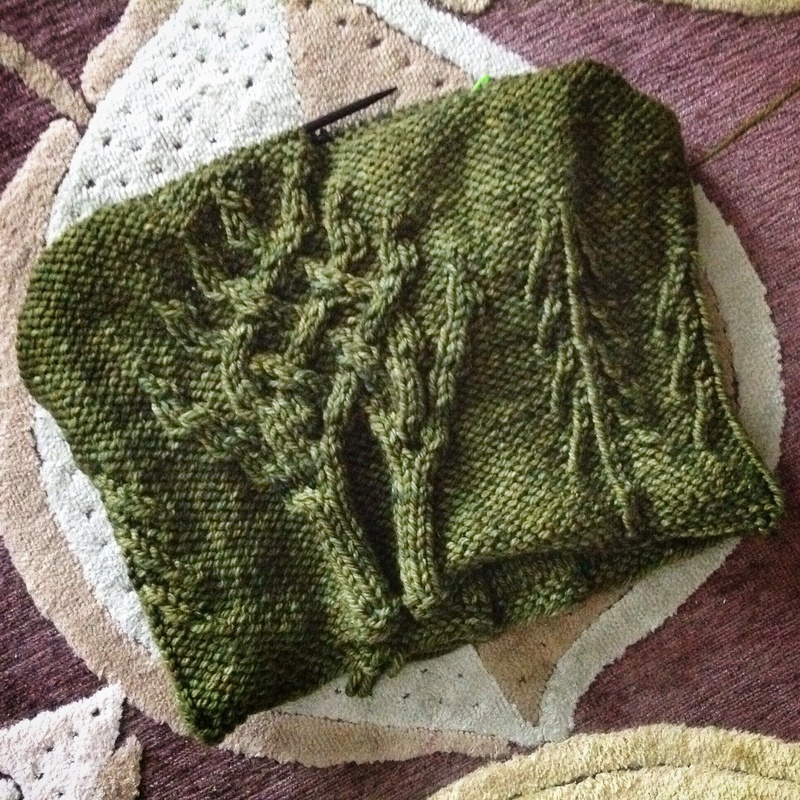 And here’s a teaser for you: My Snowy Woods Cowl KAL casts on September 1. 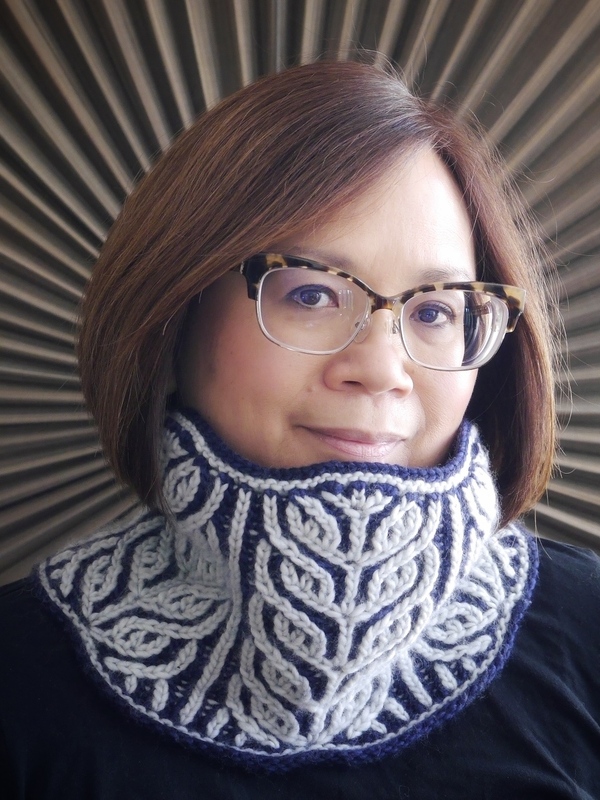 I’m extending the discount on the Snowy Woods pattern through Thursday September 4; use the discount code FROST when checking out to get $2 off your pattern. 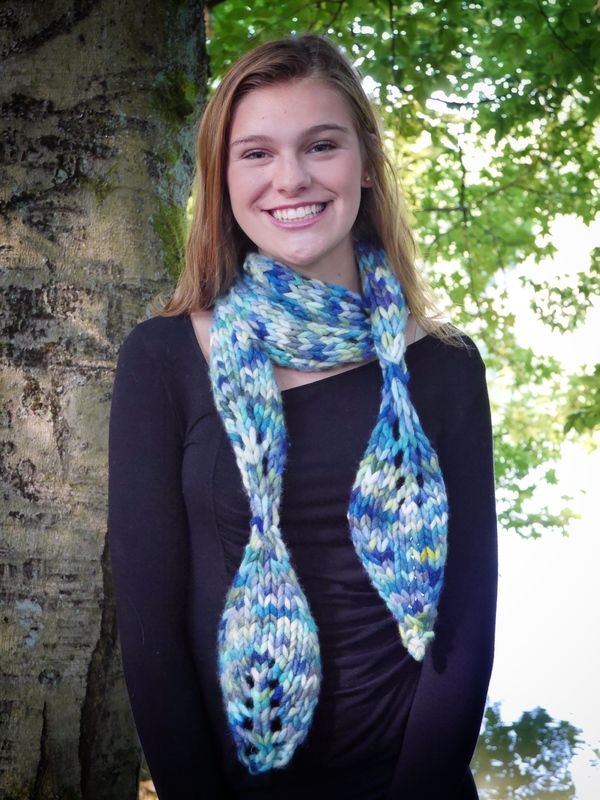 Here’s the link to the pattern page on Ravelry. 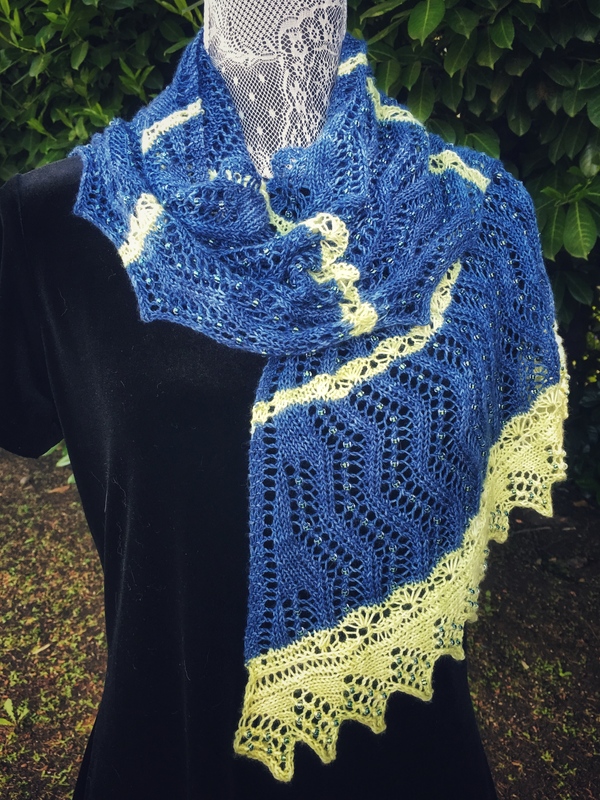 You can join the KAL on my Ravelry page for chatter and support. Check back tomorrow, September 1, to learn how to avoid running out of tail for your long tail cast on! It was rainy! And windy! And fun. After class, I went upstairs in the main pavilion to find my peeps. 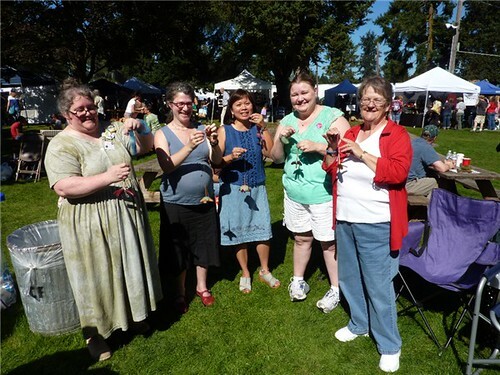 In normal years, we knit and spin on the lawn. This year, groups moved inside. I didn’t bring my Turkish Delight spindle because I knew I couldn’t linger. But I should have brought it for a photo op! OFFF is the time the Turkish Delights get together. Leila, who tempted me into buying *my* spindle, has a tinker toy spindle here. And Rachel, whom I tempted into buying *her* spindle, has hers here. At OFFF 2009, we were spinning on the lawn with our new spindles. Time flies! I chatted a bit with Ed and Wanda Jenkins. 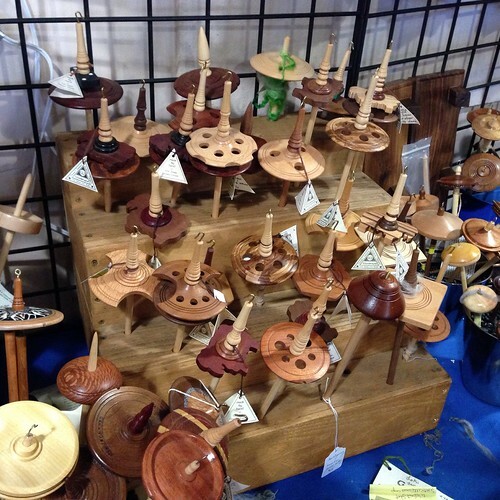 Ed makes these beautiful Turkish spindles. He remembered me and asked if I was spinning. Not much these days, unfortunately! Knitting away. I spent a little time in the barn. Alpacas always make me grin. Is it weird that I was munching a lamb sandwich while walking through? 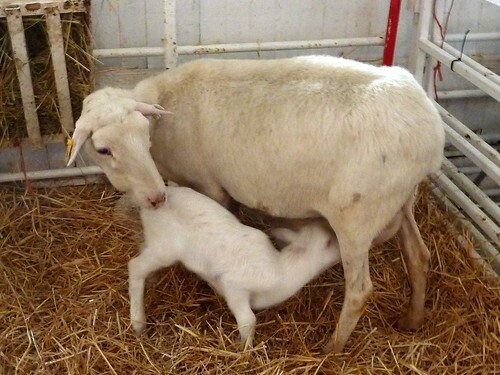 The lamb is from SuDan Farm. 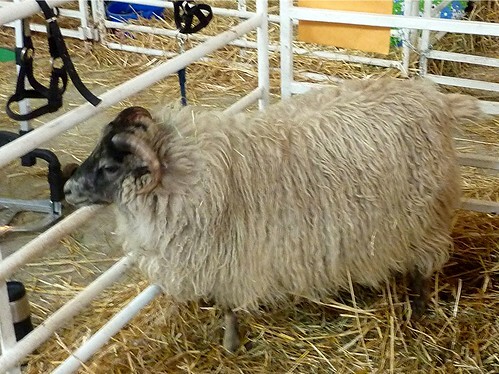 They raise sheep for both food and fiber. I did a little shopping. 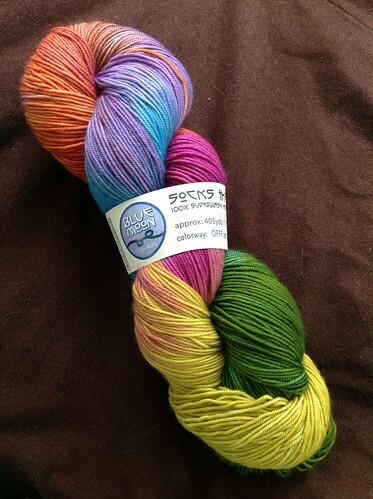 I picked up a skein of Socks that Rock mediumweight from Tina at Blue Moon. This is her last year at OFFF (going to concentrate on wholesaling rather than shows), so she dyed this gorgeous commemorative colorway. 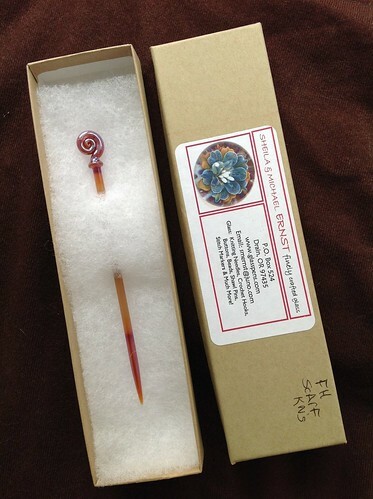 I also bought a shawl pin from Michael and Sheila Ernst. They make glass pens, knitting needles, crochet hooks, buttons. I have admired their work at many shows over the years. Isn’t this lovely? Approximately 10,000 stitches. Why didn’t I listen to that little voice sooner? But I love the revised version that I’m knitting, and I think I’m back up to about 7500 stitches so far. The little voices are laudatory this time…or are they just playing me? It’s rainy and windy today, perfect for knitting. The forecasst for tomorrow looks worse. I’m teaching at OFFF in the morning, and shopping after that. I’m not sure the outdoor vendors will hang on that long! I helped Lorajean set up yesterday, and she just messaged me that they’re going to pack it in today. Some of the outdoor vendors didn’t come at all, and the one scheduled to be behind us looked around and decided not to set up. There’s still shopping inside, though, and the animals in the barn, so I plan to enjoy it all anyway. 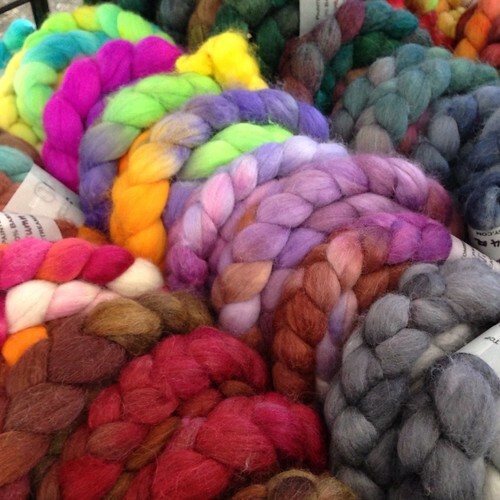 I’m kind of coveting this fiber, even though I’m not currently spinning. Isn’t it gorgeous? 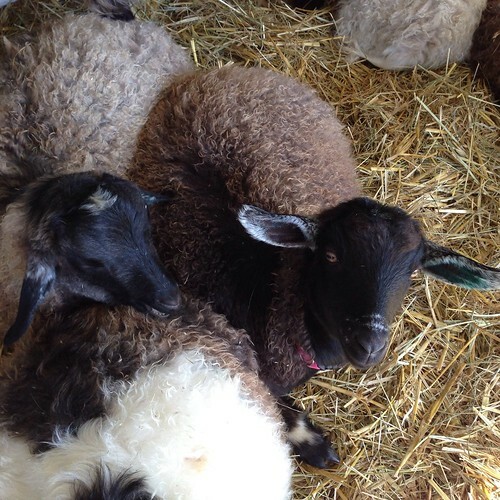 Black and white BFL, hand dyed by Knitted Wit. Even prettier in person. If you’re local, I hope you had a chance to get to OFFF today, or are planning to do so tomorrow!